Correct identification of mineral phases in rock thin sections is essential to petrographic and petrologic analysis of rocks. Traditionally, analysis using polarized transmitted light and reflected light microscopy have been the standard techniques employed, with optical cathode-luminescence microscopy used to a much more limited extent. Optical microscopy techniques are taught in core courses in all undergraduate geology curriculums and petrographic microscopes are part of the basic instrumentation of all academic geology departments, most State and Federal geology agencies (e.g. U.S. Geological Survey), and many private geoscience companies in the mineral and energy resources sector. Micro-Raman mineral analysis offers several important enhancements to standard optical techniques (Nasdala and others, 2004). First, based on the diameter of the excitation beam and the specifications of microscope objective lens, illuminated spot sizes of single digit to several tens of microns can be attained. This results in the ability to generate spectra from very-fine grain sizes, sizes that are difficult to impossible to acquire standard interference figures for birefringent minerals. Because many accessory and secondary alteration minerals occur in very fine grain sizes, this greatly improves the ability to identify minerals in their in-situ textural context with other minerals in the rock. 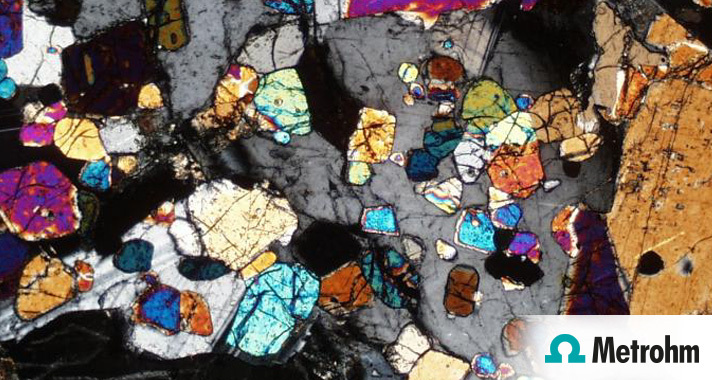 Identification of mineral phases in rock thin section is sometimes difficult to impossible using traditional optical techniques alone, especially for very fine-grain sizes (< 100 microns), common solid-solution series members (e.g. plagioclase, garnet, pyroxene series members), and opaque minerals. Micro-Raman imaging using an interfaced laser/spectrometer system such as the B&W Tek i-Raman Plus system with a standard petrographic microscope with 100x-150x objective lenses (e.g. Olympus BX 40 and 50 series) can overcome these optical identification issues while allowing the microscope platform to be used for traditional petrographic analysis as well. Micro-Raman analysis also can provide valuable semi-quantitative chemical information about mineral phases. Given the relatively modest acquisition costs, almost zero annual maintenance costs, and lack of dedicated operational technician and special lab space requirements, micro-Raman systems represent a very attractive technology enhancement for all College and University geoscience departments, as well as government geoscience agencies, and private mineral resource consulting firms. Download the white paper below for full details.